This is the fifth article in a ten-part retrospective of the Harry Potter soundtracks. You may wish to refer to the previous entries in the series for more information. After John Williams’s work on the first three Harry Potter films, who would the studio get to step up and take on the mantle of the fourth, and longest, and biggest-in-scope: Harry Potter and the Goblet of Fire? Well, I for one had never heard of Patrick Doyle — though apparently he had done films I’d seen, including Dead Again, Exit to Eden, and Gosford Park. Most recently, he’s scored Kenneth Brannagh’s Thor and the new Rise of the Planet of the Apes. Apparently the guy had the chops to be considered. And he pulled off what I think is the best of the eight Potter soundtracks. From the very beginning — “The Story Continues” — we’re told that this film is going to be darker and scarier than any of the others, despite what we know to be several action sequences and Harry’s first foray into romance. Astute listeners who are also fans of Family Guy will hear that the main “sinister” theme of the film sounds a lot like the phrase in the show opening that goes “lucky there’s a Fam-i-ly Guy…” It’s also heard again very prominently in horn form in “The Dark Mark”, which incorporates it along with some cues that sound very similar to ones heard in Star Trek: Nemesis. I’m going to go ahead and call it the “Family Guy” theme from here on out. “The Quidditch World Cup” — Ireland and Bulgaria get their own themes, with the latter to become Krum’s theme when he reappears at Hogwarts. The Bulgaria theme is particularly good at making you think all the Bulgarians (and therefore Krum) are evil. “Foreign Visitors Arrive” — All three schools arriving: Hogwarts, then Beaubaxtons, then Durmstrang. Beaubaxtons has a theme that is particularly well-suited to them, but it also sounds like “oh, these characters are going to be completely useless in the finale”. It does, though, very neatly segue to the appearance of the Durmstrang ship. “The Goblet of Fire” — Doyle weaves together three distinct versions of the same theme for the choosing of the names. “Golden Egg” — I cover this a bit later, but this track gives us the first instance of the film’s “triumphant” music cue, and in similar fashion to other techniques Doyle has used to this point, he’s still weaving in the main theme of the film — “Family Guy” again. I was slightly disappointed that there wasn’t anything of “Hedwig’s Theme” in it, but I can forgive it. The same theme is repeated in slightly-less-bombastic form in “The Black Lake”. “Cedric” — Although the music behind Amos Diggory as he realizes Cedric is dead is a little too overblown, it does the work that the film couldn’t do (but the book did) in making you care about Cedric enough to react to his death the way the author wanted you to. “Another Year Ends” — A sweeping melody that really encapsulates the friendship of the Golden Trio. It’s a bit too positive, given that war has just begun, but I guess the point is to show you that, hey, despite all this ugly stuff going on, love still prevails — which, as we all know, is Dumbledore’s main point throughout the books (the importance of love). I was a little less impressed with the “Hogwarts March” and “Hogwarts Hymn” — both had their place in the film, but they seemed to break up the soundtrack a little more than I personally would’ve liked. There were also the waltzes — Neville’s and Harry’s — which were completely in-place in the film, but when listening to the soundtrack they do make me put my head on one side just a bit. They’re placed in the soundtrack when they occur in the film, but they also provide a little break from some pretty heavy musical numbers. Doyle’s strength with this soundtrack was to create a series of cues and themes — the “Family Guy” theme, the music and mood he used for the Voldemort sequences, the waltzes and love themes — that feels, for the first time, like a complete piece of art. He also “teases” upcoming tracks, such as the shift from “Harry Sees Dragons” to “Golden Egg”, which I find to be a really cool technique — basically priming you to hear more of what you just heard without thinking “oh, hey, here’s a new gigantic bombastic piece of music you’re totally unprepared for”. It happens again with “Neville’s Waltz” and the repeated themes from it heard in “Harry Potter’s Love” — a wonderful love theme and one that I occasionally find myself humming when I’m not paying attention. And then they both come together for “Potter Waltz”. Though there are a few songs peppered in here and there that I personally didn’t care for, for the first time in the series, we’ve got a start-to-finish soundtrack that I can sit back and enjoy without occasionally asking myself what just happened. 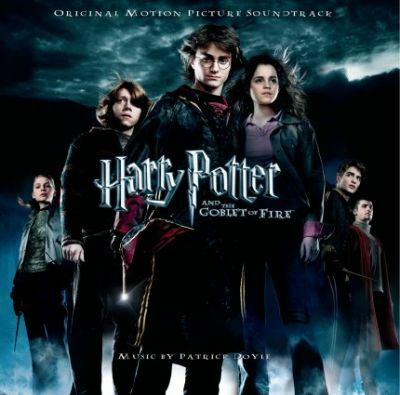 I was extremely disappointed that Doyle wasn’t brought back to score more of the films, but I’ve yet to be disappointed by any of his work, and this soundtrack is part of what makes Harry Potter and the Goblet of Fire such a great film. In addition to the orchestrated part of the soundtrack, a band was created to perform three songs under the name “Weird Sisters”. It featured members of Pulp, Radiohead, All Seeing I, and Add N to (X), and was fronted by Jarvis Cocker. The three songs they performed, including the one that ran during the credits, are at the end of the soundtrack. I’m not going to review them, except to say… they’re okay. Nothing good or bad to say about any of them.